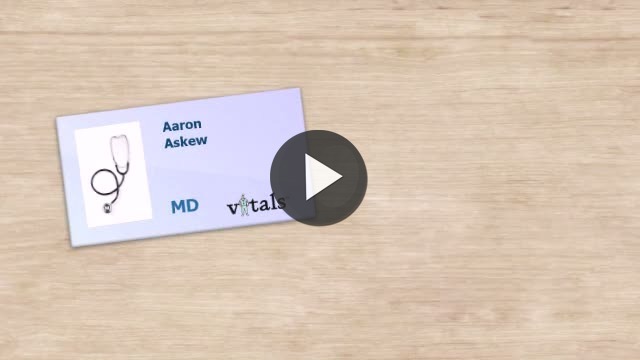 Dr. Aaron E Askew, MD is a Doctor primarily located in Bend, OR. He has 23 years of experience. His specialties include Trauma Surgery and Orthopaedic Surgery. He speaks English. The overall average patient rating of Dr. Aaron E Askew is Great. Dr. Aaron E Askew has been rated by 24 patients. From those 24 patients 11 of those left a comment along with their rating. The overall rating for Dr. Aaron E Askew is 3.6 of 5.0 stars. This guy is the definition of a hack. SERIOUSLY DO NOT GO TO ASKEW. He made it clear the moment I walked into his office that he didn't care the slightest about my health, only getting me in and out of his office as quickly as possible. I suffered for five months with a foot injury that could have been fixed in a week if he actually listened to what I was saying. If you are looking for a foot doctor right now, seriously move on. This guy should have his license suspended. Absolutely incompetent in every way. If I could give him zero start I would. Still pain free after more than a year. Dr Askew; I had been suffering from pain in the large joint of my right big toe for years. It finally got so bad I was left with no other option but to get it corrected surgically. By luck of the draw referral from the VA, I got Dr. Askew. From the first day, I found him to be very engaging with a great sense of humor. After X-rays and examination, Dr. Askew took his time and explained my procedure throughly, answering all my questions in detail. It's been a year since my surgery and I'm still pain free. Dr. Askew is a brilliant surgeon with an outstanding staff. A special thank you to Dr. England for her kindness and compassion. I highly recommend Dr. Askew to anyone who needs a great orthopedic surgeon. He has been my doctor for over a year and a half now after I suffered from a traumatic leg injury. I am truly grateful that Dr. Askew is my orthopedic surgeon since without his expertise and care I would not have made the amazing recovery that I have made. Dr. Askew has always been very patient and compassionate during my surgeries and follow up appointments. He always takes his time to answer my questions or concerns and during the times that I have broken down crying he has offered me a box of tissues while being very sympathetic. I am grateful that Dr. Askew has such great bedside manners since my previous orthopedic surgeon was cold and unsympathetic about my injury. If you are looking for a knowledgeable orthopedic surgeon that has great bedside manners then I highly recommend Dr. Askew. I would not recommend this doctor. His bedside manor is awful. He looked down on me the entire appointment. I should have gone with my gut and requested His co worker with a stellar reputation. Wish I would have read these reviews first. Horrible and rude would never see again!!!! Went to this doctor after my PCP referred to review my case of chronic debilitating foot and ankle pain. He was a last resort for relief from 24/7 pain. I had high hopes he could help me. However, from the minute he entered the room he verbally assaulted me with put downs and negative comments. I felt I was being interrogated by a lawyer. He turned everything I said into a matter of contention and insisted on arguing with me about every comment. I felt belittled and personally attacked. He brought me to tears during the entire 40 minute appointment and waited for 10 mins. of crying before offering me a tissue box that was sitting right next to him. He was unfeeling, rude and condescending to the point of making me feel 2" tall. I felt like a kid in trouble and getting a talking to by my parent. He did almost nothing to examine me and told me he felt I needed to hear what he had to say and that it was "time" I hear it. Told me the doctors I had already seen knew more about my ailments then he did and to return to them for care. But...they referred me you idiot! Supposedly to get his "professional" opinion about whether something orthopedic was going on. He just didn't care. I haven't gotten the bill yet but am sure it's likely $500 or more for absolutely NOTHING! I would NOT recommend this doctor to anyone. He is cold, and has no bedside manner whatsoever. If I could rate him a zero I would have. Go see Dr. Moore, I've heard nothing but wonderful things about him. Unfortunately, I saw Dr. Askew because my PCP's family member had surgery done by him and they were pleased, so he came with high marks from them. I suppose he treated them differently because she was a doctor too. Take a minute to learn about Dr. Aaron E Askew, MD - Trauma Surgery in Bend, OR, in this video. Dr. Aaron E Askew is similar to the following 4 Doctors near Bend, OR. Have you had a recent visit with Dr. Aaron E Askew? Select a star to let us know how it was.